Marriott’s Grande Vista in Orlando, Florida is an elaborate and sophisticated resort centrally located near many popular attractions, including Universal Orlando and Walt Disney World. Grande Vista guests will enjoy spacious villas to relax in after a day of theme park excitement, and can also take advantage of the on-site golf course, Grande Vista Golf Club. When you buy a Marriott Grande Vista timeshare on the resale market through our independently owned and operated website, you ensure your family years of memorable Florida vacations. As a Marriott Grande Vista timeshare resale owner, you’ll have access to luxurious accommodations and resort amenities. The Grande Vista offers one-, two-, and three-bedroom villas with plenty of space for everyone to spread out and relax. Each villa features living and dining areas, full kitchens, a washer and dryer, and a large soaking tub in the master suite. The resort is also home to two championship golf courses. Families of all sizes and ages will find entertainment at this Marriott Vacation Club resort. 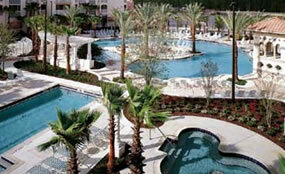 Marriott’s Grande Vista in Orlando is perfect for a family vacation to Florida or a romantic getaway. If you find yourself visiting this beautiful Orlando resort every year, a Marriott Grande Vista timeshare resale may be perfect for you. Buy a timeshare at Marriott’s Grande Vista through our independently-operated website and you can plan easy and affordable Florida vacations year after year. When you own a timeshare, you’ll also avoid the rising costs of hotels. With your timeshare resale at Marriott’s Grande Vista, you’ll enjoy top-notch amenities and accommodations in one of the world’s most desirable vacation destinations. Are you interested in timeshare at Marriott’s Grande Vista, but would like to try it out before purchasing? You can also rent a Grande Vista timeshare by owner. With a timeshare rental, you will still experience high-quality timeshare accommodations and make the most of your vacation, while avoiding expensive hotel rates. Our independent timeshare resale specialists at GrandeVistaOrlando.com can also help timeshare owners sell or rent out their units. Learn more about how to sell Marriott Grande Vista timeshare or find out how much your Marriott timeshare is worth free of cost and obligation.